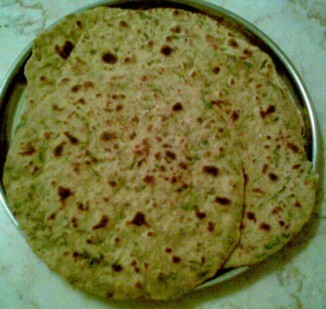 Methi theplas are very popular cuisine from gujrat. Methi theplas are good and healthy for diabtes people. They are spicy in taste and can be stored for 2-3 days at room temperature. Methi leaves also called as fenugreek leaves is used to prepare methi theplas. Yoghurt for mixing (approximately 1 cup). Wash the leaves and chop them finely. Mix all the ingredients except oil for shallow fry . Knead into soft dough using as much as yoghurt as required. Divide the dough into 12 small parts and make smalls of it. Sprinkle flour while rolling , it makes it easier to prepare the theplas. Shallow fry the thepla over tava on both the sides till they are cooked, baked and change its colour to little brown. Similarly repeat the process for remaining balls and make theplas of them. Cool them in room temperature. Serve with chutney (green chutney also called coriander chutney). Shelflife: Can be stored for 2-3 days if packed in foil and stored in air tight container at room temperature. Note: Theplas can be made crisper by not applying oil while heating them over tava.